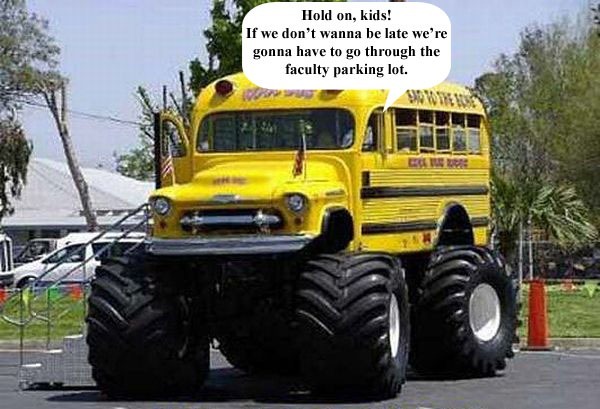 While on the bus the other day, I happened to notice a sign from the Queensland government, stating that one full bus takes up to 40 cars off the road. That was all. No real information as to what 40 cars off the road means. For all I knew it could mean one bus could literally ram 40 cars off the road with the sheer force of 50 or more passengers behind it. No car stood a chance with a full bus on the road! Be warned! While this was quite the scary thought, and rather turned me away from the idea of riding on the bus again, it got me thinking. Greenhouse gases and climate change are rapidly becoming some of the most talked-about subjects in Australia with up to 73% of people reporting concern over climate change in 2008 . Between the years of 1990 and 2008 in Australia, the annual emissions of greenhouse gases saw a 31% increase, not including the emissions from land use, land use change and forestry . It is believed that these high levels of gases in our atmosphere will begin to affect our climate by causing more heat to be trapped, leading to increased global temperatures, also known as global warming . Julia Gillard’s administration has tried to combat this increase of greenhouse gas emission with the recent unveiling of the carbon tax starting July 2012. The tax will start by charging around 500 companies $23 for each tonne of CO2 they emit . However, large companies aren’t the only producers of greenhouse gases. The primary producer of greenhouse gas emissions is from stationary energy, such as companies using fossil fuels to provide electricity for homes. This is followed by agriculture, where the gas emissions mainly come from methane gas from animals. And the third largest producer of gas emissions is transport . Although the gas emissions due to stationary energy and agriculture are hard to change as an individual, transport can easily be affected. Out of the 13% of greenhouse gas emissions that transport activity adds to the environment, passenger cars are the largest source of the gases, accounting for 53% of the emissions. Buses, however, are the most energy efficient mode of transport per person, followed by heavy rail trains and motorcycles. Passenger cars and ferries are the least energy efficient . There are several benefits to train and bus travel, such as greatly reduced CO2e emissions per person when compared to passenger cars. A full bus also greatly reduces the congestion of roads by removing up to 40 cars from the road – leading to further reduced CO2e emissions . Public transport is also increasing in popularity, as the number of people using public transport for usual trips to work or full-time study has risen in almost every state since 1996  . Many people still prefer passenger cars over public transport, however. In 2009, 80% of Australians reported using private motor vehicles as their primary method of travel to their work or study, and only 14% used public transport . When asked why they didn’t use public transport, 52% of people reported either complete lack of services or lack of services at the right time . Our goal with Transhub is to help make public transport work for everyone, by both simplifying and improving the overall experience. We want to help everyone be able to take part in helping to reduce greenhouse gas emissions by using cheap and reliable public transport without any of the hassle usually associated with it. This week we were able to expand TransHub to 7 cities – now including Canberra. We were able to do this because the dataset for Canberra became available on data.gov.au. Just over 5 years ago we saw the first campains to “Free Our Data” in the UK. Governments in every country collect and hold a massive amount of data, much of it very useful in our everyday lives, and quite often data you have to pay to get hold of and not necessarily in a particularly useful format. The idea behind this campaign was the Governments should collect the best quality data possible and then make it available for free to all. In recent years there has been a push for Australian government agencies to make more data available to the public. Since then Data.Gov.Au has been created. Data.gov.au provides an easy way to find, access and reuse public datasets from the Australian Government and state and territory governments. The main purpose of the site is to encourage public access to and reuse of government data by providing it in useful formats and under open licences. The great thing about putting up the data so the public can use it, is that developers, businesses and hobbyists can use the data and mash it up in ways that were never before thought of and make useful sites, applications and creations for others to use. To show how powerful publishing data in an open format is I’ll take you through the process we went through of creating TransHub Canberra. When we created TransHub Sydney, we had thought of expanding and reusing the same idea with other cities. Some minor code changes were made from the original competition entry to allow us to apply to different modes of transport in Australia (an other metric countries). This allowed us to easily apply other datasets that we had at our disposal such as Adelaide, Auckland, Cairns, Perth and Townsville. We noticed the Journey Planner Data for the ACT had been made available on Wed night 5/10. By Thursday 6/10 we had made the necessary adjustments and internal testing to prepare TransHub Canberra for Beta Testing. The image for the mosaic is NASA’s Blue Marble Imagery cropped to the political boundary of Queensland. The mosaic was created using AndreaMosaic’s 64bit professional version, Photoshop CS5 and DeepZoom tools. It was processed on a Dell dual 6 core Xeon X5680 T5500 Workstation with 24GB Ram. It took just under 7 days to compile the images, mosaic, process, tile and upload to our website. The energy used to power the hardware was offset by our 6KW/h Solar System and the awesome Queensland Sun. The maps are predominantly from Brisbane but also cover some regional areas of Queensland such as the Gold and Sunshine Coasts. We have chosen to visualise these using an enhanced version of the Microsoft PivotViewer control, from LobsterPot Solutions, that allows us to presents 100’s of things at once and visualise them in a way that can add value by allowing multiple ways to filter and sort the collection and view details and metadata while showing the estate map image in a “zoomable” format. What is this GTFS thing anyway? Many of you have asked us what format we need the data in to be able to use it. There’s a few that are supported by we highly recommend GTFS – General Transit Feed Specification. It’s now a format accepted through many apis around the world for public transport data including Bing Maps and Google Transit. Why don’t we have TransHub Brisbane and TransHub Melbourne? Our top 2 feature requests for TransHub is to create a version for Brisbane and Melbourne. Many of you have asked why we haven’t done it and why can’t we? Currently neither Brisbane nor Melbourne publish their data publically for application developers to use. If we can’t get to the data we can’t make an application. As many of you have pointed out we could screen-scrape or crowd source the timetable and station information we really don’t want to go down this path. We’d prefer to encourage the other cities to get on board with the open formats and publish their data so everyone can benefit and do it properly! Our only thoughts are that public pressure may encourage them to change their minds and follow what the other cities in Australia and the world have done. So keep voting for the feature! Why is Open Data Sharing important? In short, let them do what they do best and let us developers develop the best apps possible on their data. If we just look at phone application developers – there are many different smart phones out there, and we all like different features and functions in applications – which is why there’s about 66 different “torch” apps just on the WP7 marketplace. The government is good at collecting this data and running it’s services, not necessarily great at writing the applications we all want to use. The cost for them to develop a fully featured transit application on every smartphone platform, to keep it current, evaluate the features that people want would be enormous, not to mention the time to market for across all of the devices would be substantial. If they just publish the data to a known standard, then application developers can make their own applications, with reliable data and bring it to market using their specialist skills much quicker. 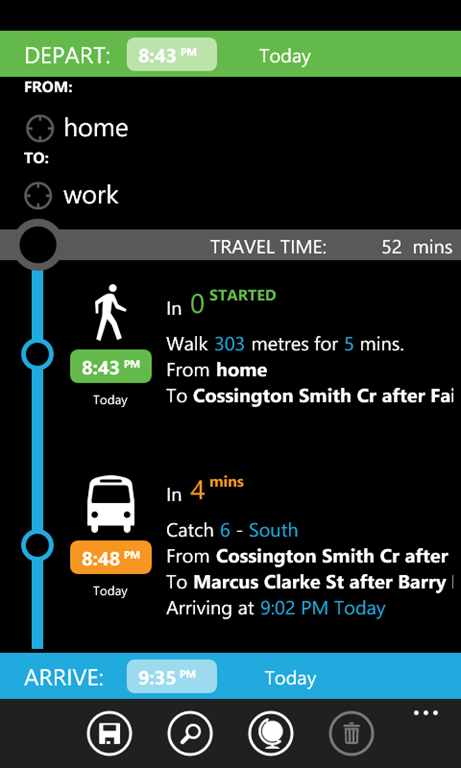 I’d love to see 10 different Brisbane Transit applications on WP7 and I’m sure many of you would love to see it on your favourite devices. For us, it would mean we can take the investment we made in TransHub Sydney, and apply it to the Brisbane data and make an equivalent application in under 2 weeks – I don’t think any government department could match that time to market. As we have customers using each city version of the application we can address, and add feature requests for a specific city and apply them across the range of cities with not much additional effort. In Australia we’re currently beta testing Canberra and hope to have that available to you very soon also. For New Zealand – we’re looking into Wellington if there’s interest. For other countries, we’re looking at adding some features for displaying/calculating distances in miles so we can support a number of cities in the USA. We’re in the process of upgrading the application to Mango so we can address a number of the features you’ve been asking for. We’ll be putting out a call for beta testers for that soon, so stay tuned. Since we announced TransHub Sydney there’s been a few articles popping up around the place. Thought it’d be a good time to put the ones we know about in one place. 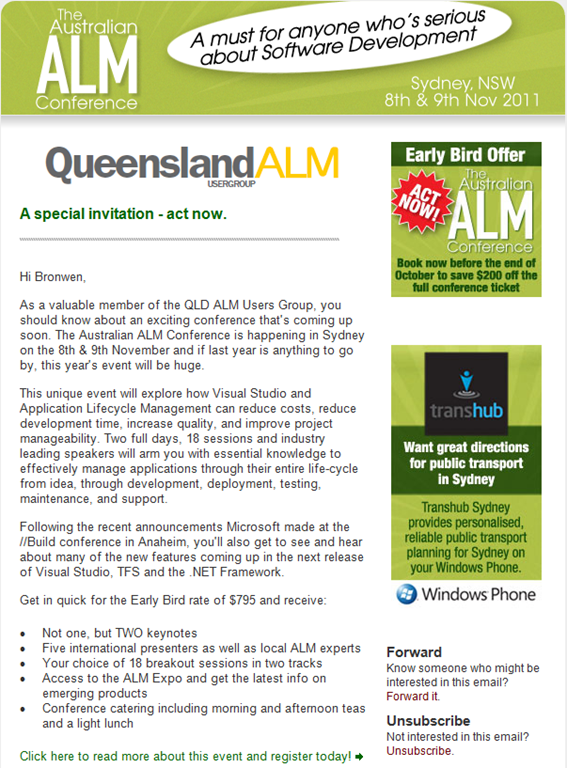 Today, TransHub was featured on in the ALM Conference newsletter and the venue page. So if you’re interested in this great event exploring Visual Studio and Application Lifecycle Management and how it can reduce costs, development time etc. register for the event here. If anyone else spots any others please let us know! Day 1 of Build is over! Today Microsoft shared with the world their brave new Operating System, Windows 8. Honestly we weren’t expecting much more than a new touch shell on Windows 7. We were wrong. 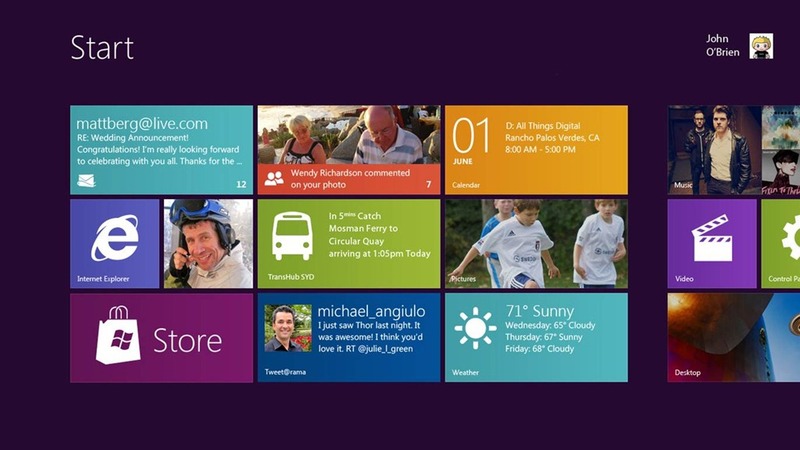 A whole new API, WinRT, provides c++, c# and HTML5 developers with the full power of windows in new “Metro” applications. These applications can be packaged up and sold through the new online marketplace, it looks like a next generation of the current Windows Phone marketplace. The day at Build was divided into a morning keynote and then three afternoon “big picture” sessions. 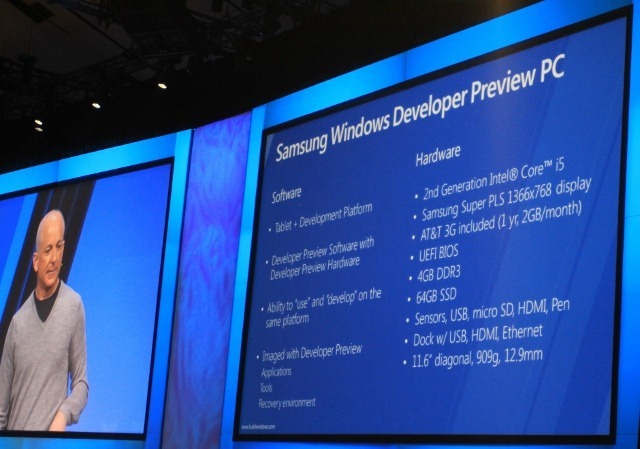 Highlights from the morning included our first look at Windows 8 running on stage, the announcement that Windows Live have rebuilt all their applications to get the maximum from the new OS and, to great applause from all the attendees, a walkthrough of Win8 running on many devices including a new developer Samsung tablet, 5000 of which would be given to the developers here at the event. Windows 8 really looked good today, shown on no less than a dozen different devices from small multi-touch tablets to 3 way SLI gaming desktops the experience was “fast and fluid”, one of several new Microsoft phrases to describe the work they have kept secret for the last three years and revealed today. The afternoon sessions dived into application design principles and code. 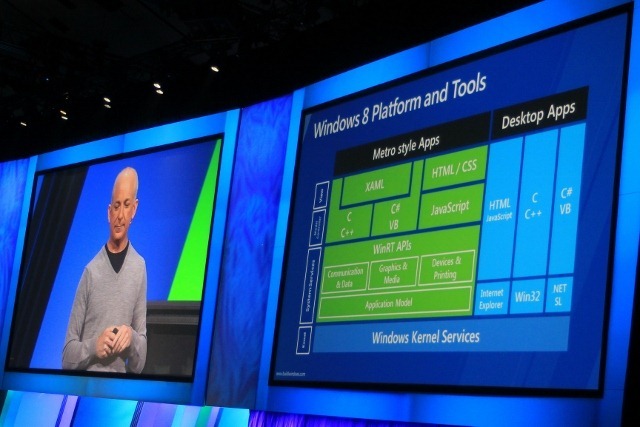 Microsoft clearly wants the developer ecosystem to get into gear and create a marketplace full of apps for the Windows 8 launch. 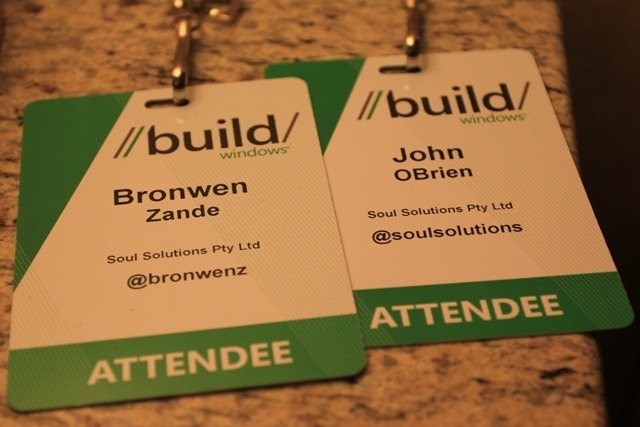 Soul Solutions will be building Transhub specifically for Windows 8. For us being able to deliver your latest transit information in a really fast, fluid and beautiful way is the key driver. Innovations like live tiles from Windows Phone now becoming the home screen of Windows 8 allows us to put your upcoming journeys right in front of you on the next generation tablet hardware. Over the next 3 days we will be attending deep dive workshops covering every aspect of the new Metro apps for Windows 8, we’re really excited by the future of the PC. Today we headed off to LAX via Sydney for Build. 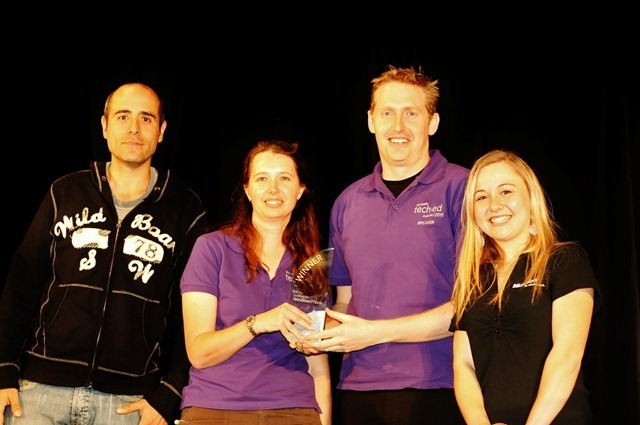 This was part of our prize for winning Spotlight 2011. Made our way out to the hotel via the shuttle to Anaheim jumping on the Disney Express Shuttle ($22 p/p + tip) and they drop you at your hotel which is pretty cool. Then off to the Convention Centre to pick up our badges. Walking into the convention centre the registration area is MASSIVE, in fact the whole area is huge. Looking forward to the big keynote tomorrow! Last Wednesday, after months of really hard work, we presented our Spotlight competition entry to an audience of over 100 people including Microsoft staff, Government officials and of course Teched Australia attendees. We were up against some great competition with some really cool applications using government data. The competition came down to audience vote at the end of the night, and we’re excited to be able to say we WON! As part of our prize we’re off to BUILD next week and hopefully gain some knowledge on how to expand TransHub onto other devices/platforms in the near future. We’d like to thank everyone who voted for us and all the people that came and spoke to us during the event about the application. We’d also like to thank those that helped us test and make the application better. We’re taking feedback over at http://feedback.transhub.com so we can put in the features you think are most important. We’re currently looking for beta testers for TransHub Perth – so please get in contact at contact@transhub.com if you’re in Perth, have a WP7 and would like to test it out for a week for us. We’ll put out announcement for other cities really soon aswell so stay tuned.